Permanent resident cards, popularly known as green cards, open up a world of possibilities for immigrants in the U.S. Not only does it serve as identification, it is also evidence of the immigrant's right to live and work in the U.S. If you're an employer, you have a responsibility to ensure potential employees are eligible to work in the states before you hire them. Since the green card confirms an immigrant's work authorization, you want to make sure it's not fake. In 2010, U.S. 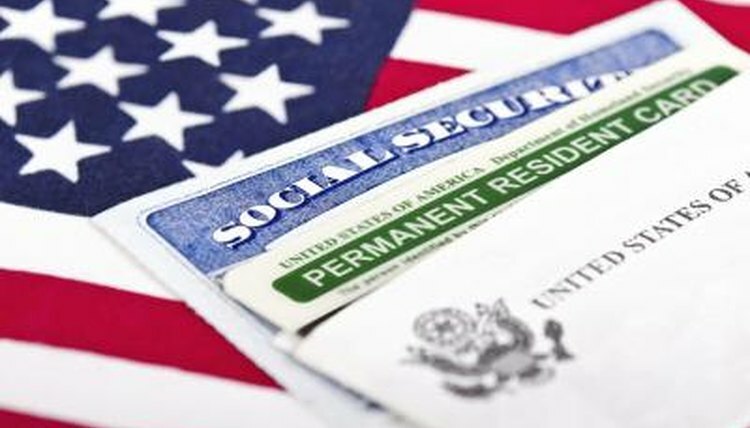 Citizenship and Immigration Services revamped the green card to make it easier for employers and the U.S. Department of Homeland Security to verify the identity of immigrants working in the states, safeguard the public from potential threats and detect fraud. To confirm a green card is authentic, look for certain features on the front, such as a USCIS identification number, color-shifting ink that changes from green to gold, detailed background design and patterns, laser engraved fingerprint, and a holographic photo of the immigrant. On the back, look for an alien registration number, high-resolution image of state flags and U.S. president, another hologram photo of the immigrant and his return address. In addition, the card is actually green in color. The previous 2004 version of the green card is still in circulation -- it is white and contains a photo of the immigrant on the front. What Is a Non-immigrant Visa Number? In addition to confirming that the traditional features of a green card are present, you can examine the card for some common signs of fraud. These include misspelled words and typos, form number other than I-551, incorrect format for 13-digit alien registration number, or inconsistent font, alignment and layout. Jane, Mary. "How to Identify a Real Permanent Resident Card." , https://legalbeagle.com/5751276-identify-real-permanent-resident-card.html. Accessed 25 April 2019.